Links to galleries of limestone pavements in Burren of Co Clare (click on hot spots on map to visit pages). The gentle Variscan folding of Carboniferous of Ireland (Coller, 1984) initiated the fractures expressed in the classic limestone pavements and karst topography exposed in Burren region of Co Clare. Here the character of the fractures is enhanced by post glacial dissolution and karstification (Williams, 1966; Vincent, 1995; Drew, 1994; and Gillespie, et al 2001). The fracture systems (joints and faults) have been the topic of studies that have been used to establish the major controls and scaling behavior of fracture systems expected in reservoir rocks (Odling et al, 1999; Gillespie, et al 2001). At least two Pleistocene glaciation events are thought to have scoured higher elevations of Co Clare producing south west oriented glacial striae in the rocks below the ice (McNamara, and Hennessy, 2010). In some cases kharstic features are absent where thick glacial deposits overlie the limestone and the limestone pavements. Here this suggests that the karst features are post glacial. However elsewhere in low lieing areas karstification is seen to have occured here this is interpreted to have occured in the Tertiary (McNamara, and Hennessy, 2010). 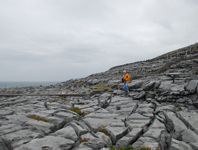 McNamara, and Hennessy (2010) suggest the pattern of high ground in the Burren and the lowland karst nearer Gort is related to when the overlying shale cap was removed and its protective effect withdrawn. 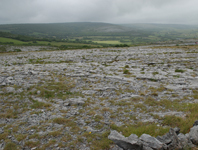 The High Burren only lost its Namurian shales during the last glaciation event, whereas the lowlands were exposed to erosion and weathering of the limestone itself much earlier. Higher relief blocks of the pavement are called clints while the enlarged joints surrounding the clints are knows as grikes, where plants may be rooted. Castaing, C., A. Gentera, B. Bourgine, J.P. Chile`s, J. Wendling, P. Siegel, (2002), Taking into account the complexity of natural fracture systems in reservoir single-phase flow modeling, Journal of Hydrology 266, 83–98. Coller, D.W. (1984) Variscan structures in the UpperPalaeozoic rocks of west central Ireland: Geological Societyof London, Special Publications 14, p. 185-194. Drew, D. (2001) Classic Landforms of the Burren Karst, Geographical Association in conjunction with the British Geomorphological Research Group. p. 52. Drew, D.P. (1973) A preliminary study of the geomorphology of the Aillwee area, central Burren,Co. Clare: Proceedings of the University of Bristol Spelaeological Society 13, p. 227-244. 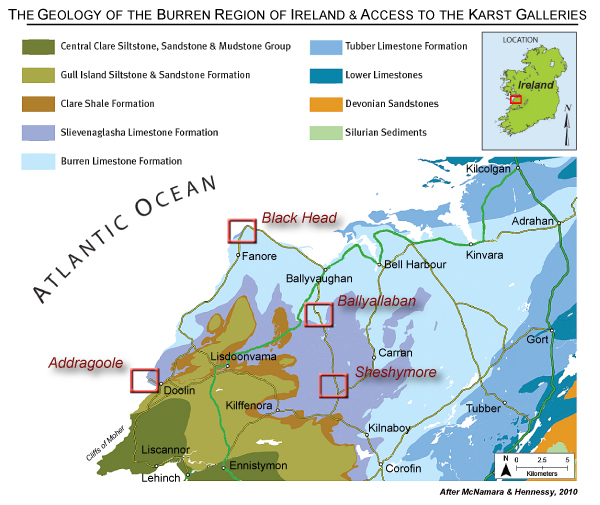 Drew, D.P., Burke, A.M., & Daly, D. (1996) Assessing the extent and degree of karstification in Ireland: Proceedings of International Conference on Karst Fractured aquifers - vulnerability and sustainability, Katowice-Ustron, Poland, p. 37-47. Gallagher, S., 1996. The stratigraphy and cyclicity.of the late Dinantian platform carbonates in parts of southern and western Ireland. In: Stogen, P., Somerville, P., Jones, G.L. (Eds. ), Recent advances in Lower Carboniferous Geology. Geological Society Special Publication 107,pp. 239-251. Gallagher, Stephen J. & Somerville, Ian D., 2003, Lower Carboniferous (Late Viséan) Platform Development and cyclicity In Southern Ireland: Foraminiferal biofacies and lithofacies evidence, Rivista Italiana di Paleontologia e Stratigrafia; Volume 109 No. 2 Pp. 159-171. Gillespie,P.A., Walsh, J.J., WattersonJ., Bonson, C.G., and Manzocchi, T. (2001), Scaling relationships of joint and vein arrays from The Burren, Co. Clare, Ireland, Journal of Structural Geology 23, 183-201. Grahan, J.R. & Ryan, A. (2000) IAS DUBLIN 2000 Field Trip Guidebook. Department of Geology, Trinity College, Dublin. 152 pp. Hodson, F. (1952) The beds above the Carboniferous limestone in North-West County Clare, Eire: Quarterly Journal of the Geological Society 109, p. 259-283. Leeder, M.R. (1988) Recent developments in Carboniferous geology: a critical review with implications for the British Isles and N.W. Europe: Proceedings of the Geologists’ Association 99, p. 73-100. McNamara, M. A and Hennessy, R. W., 2010, The Geology of the Burren region, Co. Clare, Ireland Burren Connect Project.175pp. McSharry, B., Philips, A. & Densmore, A. 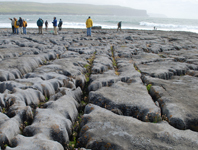 (1999), The influence of fractures on topography in the Burren, Co. Clare. Abstracts of the 48th Irish Geological Research Meeting. Irish Journal of Earth Sciences p.132. Sandford, K.S., Tratman, K.M., clayton, K.M., Pigott, C.D., Stoddart, D., Sweeting, M.M., Millar, A., Williams, P., Groom, G.E., Warwick, G.T. & Picknett, D. (1965) Denudation in limestone Regions: A Symposium: Geographical Journal 131, p. 51-56. 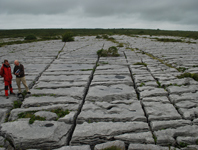 Simms, M. (2006) Exploring the limestone Landscapes of the Burren and the Gort Lowlands. Belfast. 64 pp. Sweeting, M.M. (1955 ) The landforms of northwest County Clare, Ireland. The Institute of British Geographers 21, p.33-49. Wignall, P.B. & Best, J.L. (2000), The Western Irish Namurian basin reassessed: Basin Research 12, p. 59-78. Williams, M. & Harper, D. (2003), The Making of Ireland. Immel, London, 98 pp.